Shanghai is one of China’s many cities which has seen the proliferation of bottom-up innovations, such as e-bikes, to tackle the problem of urban mobility. Photo by 2 dogs/Flickr. In developed cities, new mobility options typically only penetrate the transport ecosystem after governing bodies have developed an institutional framework around the new technology. Emerging economies, however, do not always have the regulatory capacity to standardize regulations and create policy protocols for new transport technologies. Such is the case with China’s e-bikes (short for electric bicycles), which are proving to be a disruptive, bottom-up approach to commuting that is becoming the sustainable alternative to the car for millions. Now is the time for China to embrace this ground-up innovation and move e-bikes further into the mainstream to promote sustainable and accessible transport urban mobility. The first e-bikes were created in the late 19th century, but their batteries were often too heavy for people to use or too expensive for consumers to buy, preventing e-bikes from reaching economies of scale. E-bikes remained unsafe to ride and are still considered a niche market in the west. In China, however, e-bikes emerged in the 1990s and within six years of their initial introduction, battery life was extended by 160% while price was reduced by 30%. E-bikes today reach speeds of up to 25kmh (15.5 mph), which is greater than the average 16-24 km (10-15 mph) of normal bicycles. Since e-bikes can go further, faster than traditional bicycles and are still cheaper than automobiles, they serve as the accessible option for China’s emerging middle class. Some 22 million e-bikes are added to China’s roadways each year. In comparison, car ownership has increased by only 12 million per year. Although e-bikes are not technically a public transport option and are still motorized, they are a large step in the right direction. 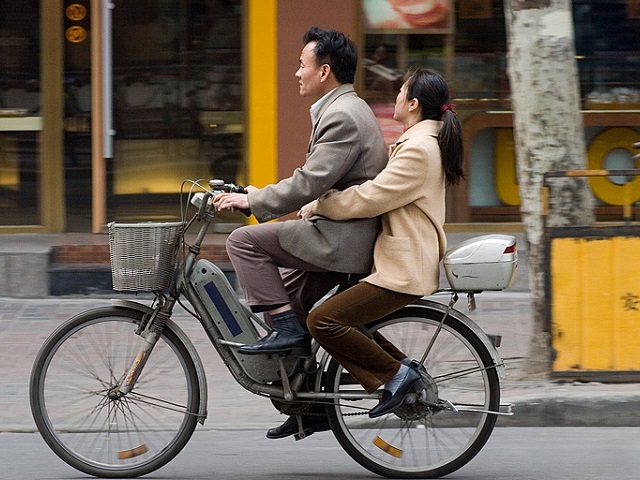 Up to this point, Chinese policy-makers have either banned e-bikes or written them off as a temporary means of transport on a user’s path to owning a car. However, the reverse might be occurring as cities are growing and new urban residents want to spend less on transport. Even for those that own a car, an estimated 30% choose to use their e-bikes for most trips because they are well equipped to weave through China’s crowded streets. This translates into 5.5 million cars that have stayed parked, 18 million barrels of oil that were left unused, and $1.8 billion dollars that have been saved per year. E-bikes pollute the air of China’s cities less than traditional automobiles, without forcing China’s citizens to desert the desire for private transport. Rather than ignoring e-bikes, now is the time for the Chinese government to accept e-bikes as a viable option for providing urban mobility for its citizens. The time is now to turn instead towards building the institutional capacity to support the growth of e-bikes, make them safer for users, and integrate them into China’s evolving transport network.